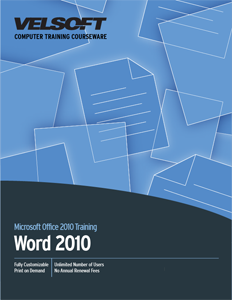 Word 2010 Training Materials are designed for trainers to teach staff and supervisors how to use Word 2010 in the workplace or at the office, at a foundation level. Confidently teach employees how to interact with Word 2010, create documents, navigate through documents, commands for tracking changes, comparing, protecting documents and more! Seeing is Believing This sample manual to teach Word 2010 is in MS Word format. The most important features of Office Word 2010 are fully explained and exemplified in our training materials through various methods. Our training materials provide instructors and students with accurate and resourceful “how-to-pictures.” The visual aid of “screen shots” included in our training materials demonstrate to users exactly where and how to access these options. The “screen shots” act as a personal trainer, showing users the correct way to perform the functions of the program. The format of our training materials ensure that instructors and students can easily follow the flow of information, step by step. Even through the most advanced applications of Office Word 2010, students and instructors can easily navigate the sections of the course. Instructors can progress with training at a comfortable rate for the class. Students are able to understand the new information, before moving on to the next section. Our training materials include Review Questions at the end of each section of the course. When students participate fully in their continued education, they are more likely to gain a sophisticated understanding of Office Word 2010. A new confidence in their skills will be demonstrated as they return to the workplace. Our training materials include Exercises for students to complete to “practically apply” their new knowledge. Students will return to their workplace having experienced Office Word 2010 in a realistic scenario. The Exercises within our training materials have been written to reflect the challenges in a workplace setting.